Our journey in Norway is continuing as we are asked to build a ‘Van Well Chopper’. Since the 1st of August, 2017, we have been supporting the renewal of the instrument suite of the research reactor JEEP-II at the Institute for Energy Technology in Kjeller. Among other things we provided support during the development of a new reflectometer: FREYJA. For this occasion we will work together with Reactor Institute Delft to build a neutron chopper. A chopper is needed, to use the TOF (Time Of Flight) method in the FREYA reflectometer to detect the wavelength of neutrons. 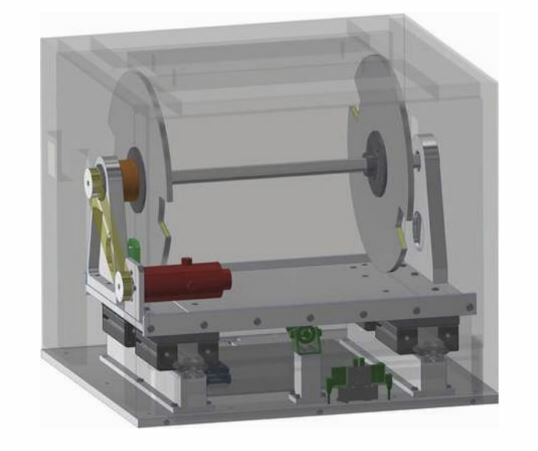 The working mechanism of this device is based on cutting a neutron beam into pieces. Hereby small groups of neutrons are created sequentially. Because the distance that is travelled by these groups is known and the time of arrival at the detector of each individual neutron can be measured, the neutrons velocity can be determined, which is inversely proportional to their wavelength. In the picture below, a preliminary sketch of the ‘Van Well Chopper’ can be seen and here an animation of the working mechanism can be found.